I am sat here angrily pounding on my keyboard as I write this post. On Friday I bought Mister A a 'Vampire Boy' costume from Birthdays card shop. Last night we had a little fancy dress Halloween party and Mister A and Little E couldn't wait to get their outfits on. All was going well, we were having lots of fun until Mister A suddenly started screaming. "I'm bleeding, aaaaaaah, Mummy, my arm." 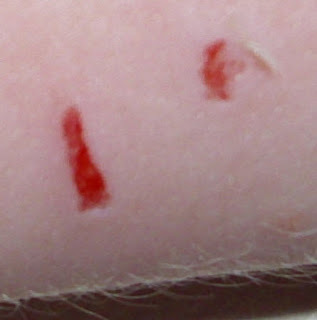 I looked at his arm and he was bleeding in 2 places - one area looked as though a chunk of skin was actually missing. I couldn't understand it, how had it happened? After about 10 minutes of high pitched screaming and sobbing we eventually managed to calm him down and he said that the medallion from his costume itad done it. The only explanation is that he lent on the medallion but why the hell would Smiffy's be so stupid to include a medallion so sharp it could do this? He is a 4 year old boy. I think this is an absolute disgrace and I await comment from them and from Birthday's. I've written this post to alert other parents and to just say be careful if your kids are dressing up for Halloween.